I am the queen of my own life. By an engraving and a few precious gens placed a chosen spots, my dream and my hopes are written on the life path of my DELANCE watch. Her first name was given to her by a loving musician of a mother who placed love above all else. Aïda is also a musician, and just like her mother, love is all for her. A unique engraving characterizes this watch.The amethysts set on the case gives a touch of calmness and clarity to this feminine jewel, a DELANCE “Amethyst” watch that recalls your spiritual nature. Laura, passionate astronomer, symbolized a comet on the case of her “Cometa” watch DELANCE. A subtle engraving punctuated at one o’clock of a ruby and a diamond, resulting from the engagement ring of her grandmother. Inspired by the shimmering beauty of centuries-old Egyptian jewellery, the case of this DELANCE is entirely hand-engraved. The emerald, the gemstone of spring, renewal and hope, beautifully completes the symbolic meaning of Life, Harmony and Spirituality. 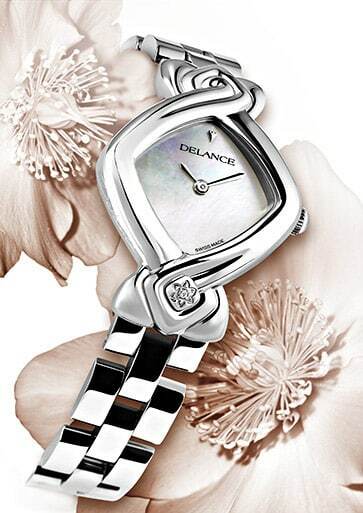 This DELANCE watch “Realisation”, a symbol of feminine talent and creative energy, was made especially for Madame Denise Filiatrault, the winner of the 2006 “Prix Réalisations.” With her many facets, Denise is the incarnation of the DELANCE woman. >She wanted all purple and thus it was engraved and set with an amethyst.To be in line with the stone the watch was adorned with mother of pearl dial in shimmering purple and a purple lizard strap.